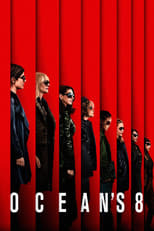 A reboot of the original Ocean's trilogy, with an all-female cast. Ocean’s 8 is directed by Gary Ross and was released on Jun 8th, 2018. Director Gary Ross's Crime & Comedy movie Ocean’s 8 is produced by Village Roadshow Pictures & Warner Bros. Pictures & was released 2018-06-07.